Breakfast radio host Hayley Pearson, and her husband Jimmy Worthington, welcomed their first child on November 3; a son named Austin Bob. Austin Worthington was born at 5:43 am weighing 3.1 kg (7 pounds). 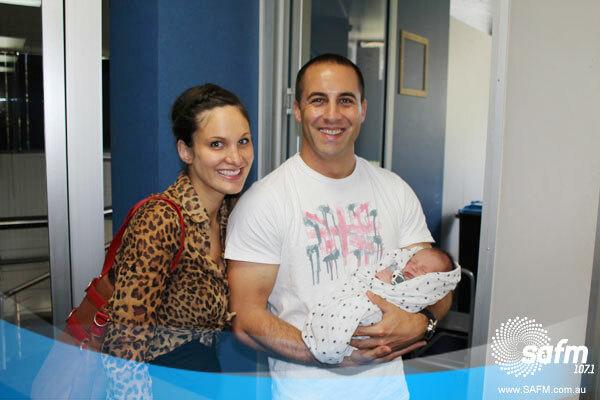 Hayley and Jimmy married in 2007, planned to start a family at the end of the year, and were instantly successful in their efforts. Hayley is co-host of the breakfast radio show on SAFM in Adelaide, has appeared on television several times, and was even an extra in a movie. In 2007, Hayley was lured to Nova in Melbourne when they heard that her weekend hobby was making fun of “silly bogan names” she read in birth announcements. In May, Hayley revealed that she and Jimmy were arguing about what to call the baby; she has been planning baby names since she was in high school and already had a list ready to go, but Jimmy “screwed his nose up” at most of them. She made it clear that she would not be revealing the baby name in advance. SAFM jokingly referred to Austin as “Darren” – presumably because they consider it to be a “silly bogan name”. I am reminded of two other breakfast radio hosts who became parents this year, in regard to baby names. Firstly, Ross Stevenson from 3AW in Melbourne, who often makes fun of celebrity baby names and names with unconventional spellings on his show, and whose colleagues made up a fake name for the new baby. And secondly, Emily-Jade O’Keefe from Triple M in Brisbane, who had also been planning baby names since high school. It seems that breakfast radio hosts have a bit of a bee in their bonnets on the subject of baby names, which makes them perfect fodder for (and possibly even perfect readers of) this blog. Ross and Emily-Jade both chose names which have been featured on Waltzing More Than Matilda, while Hayley picked a name mentioned in one of the Midweek Sibsets. Normally hearing a name with Bob in it brings to mind a hillbilly (Billy Bob, Jim Bob, etc.) but I think it’s kind of impossible for Austin Bob to do that! I love Bob. It’s just a happy name. While I wouldn’t use it as a formal first name, I do find it rather perky as a middle name. I’m seeing a lot of diminutives of William and Robert this year, so I think Billy, Bobby, Bill and Bob look like a current trend. Wonder if he’s named after Bob Marley??? Calling a child Marley after the singer is so common that back-to-basics Bob looks far less passée (and is gender specific).